A Baby Shower Party Favourite for Favours or Game Prizes. Very Cute Minature bottles filled with tiny flavoured sweets (Vegetarian Society Approved) or lovely scented Bath Salts then finished with a label printed with our cute baby for you to write your own message or each guests name onto. Ideal for Baby Shower favours for your guests, put into your favour bags or as game prizes. 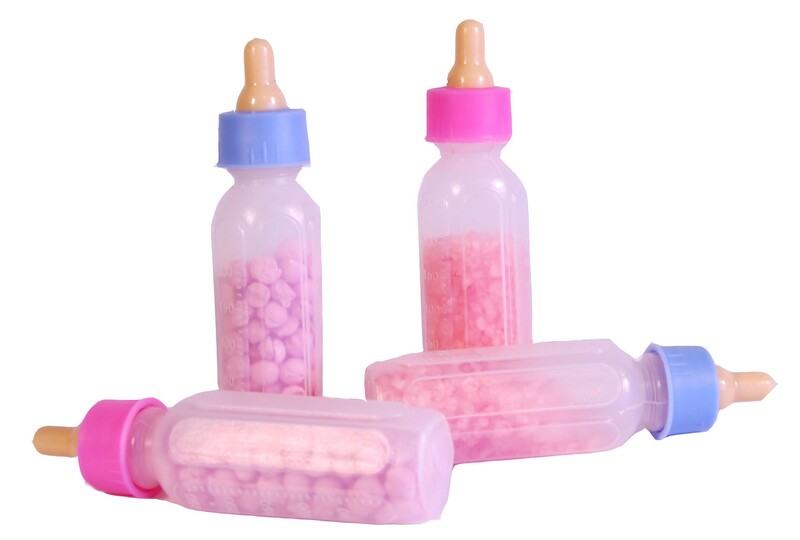 We will fill blue bottles with blue bath salts or sweets and pink bottles with sweets or bath salts. Approx 8cm tall. Lovely for your guests to keep plus children love to play with these afterwards. One little boy asked his Mummy if these were bottles for feeding baby lambs with - how sweet! FREE PERSONALISED LABELS WITH EACH BOTTLE ORDERED. Please enter your personalisation details into the comments box below.